Over the years, theSun has carried so many interviews with the cast and the director. In this blog post, we will be highlight all the interviews that has taken places starting with the director followed with the actors. Indonesian actor Nicholas Saputra shot to stardom in his first film, Ada Apa Dengan Cinta? in 2002. He was just 17. He played a lonely teenage poet Rangga who falls in love with a popular classmate, Cinta. Since then, Nicholas, now 31, has transformed himself from a handsome teen heartthrob into a credible actor, taking home the best actor award for his portrayal of Chinese-Indonesian activist Soe Hok Gie in the 2005 biopic, Gie. 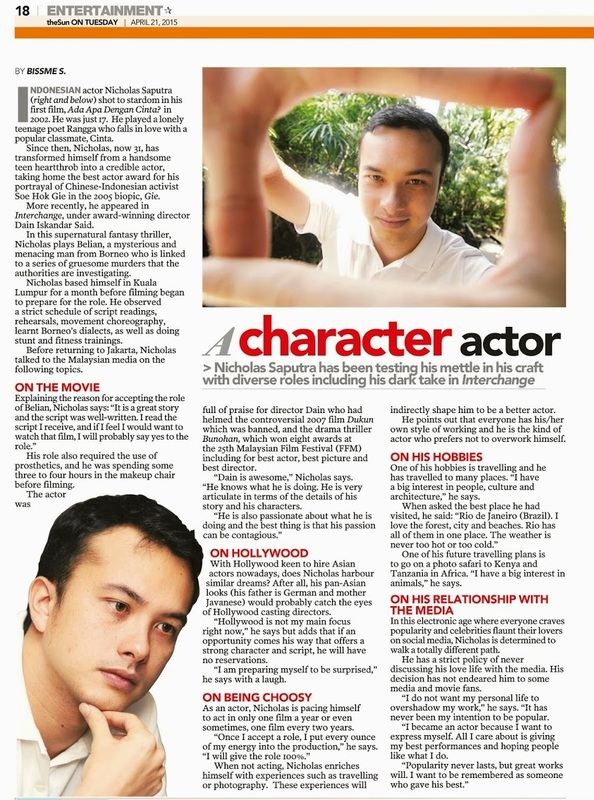 More recently, he appeared in Interchange, under award-winning director Dain Iskandar Said. In this supernatural fantasy thriller, Nicholas plays Belian, a mysterious and menacing man from Borneo who is linked to a series of gruesome murders that the authorities are investigating. Nicholas based himself in Kuala Lumpur for a month before filming began to prepare for the role. His role also required the use of prosthetics, and he was spending some three to four hours in the makeup chair before filming. Film Festival (FFM) including for best actor, best picture and best director. “Dain is awesome,” Nicholas says. With Hollywood keen to hire Asian actors nowadays, does Nicholas harbour similar dreams? After all, his pan-Asian looks (his father is German and mother Javanese) would probably catch the eyes of Hollywood casting directors. “Hollywood is not my main focus right now,” he says but adds that if an opportunity comes his way that offers a strong character and script, he will have no reservations. “I am preparing myself to be surprised,” he says with a laugh. As an actor, Nicholas is pacing himself to act in only one film a year or even sometimes, one film every two years. “Once I accept a role, I put every ounce of my energy into the production,” he says. When not acting, Nicholas enriches himself with experiences such as travelling or photography. These experiences will indirectly shape him to be a better actor. He points out that everyone has his/her own style of working and he is the kind of actor who prefers not to overwork himself. One of his hobbies is travelling and he has travelled to many places. “I have a big interest in people, culture and architecture,” he says. One of his future travelling plans is to go on a photo safari to Kenya and Tanzania in Africa. “I have a big interest in animals,” he says. In this electronic age where everyone craves popularity and celebrities flaunt their lovers on social media, Nicholas is determined to walk a totally different path. He has a strict policy of never discussing his love life with the media. His decision has not endeared him to some media and movie fans. “I do not want my personal life to overshadow my work,” he says. “It has never been my intention to be popular. I became an actor because I want to express myself. All I care about is giving my best performances and hoping people like what I do. 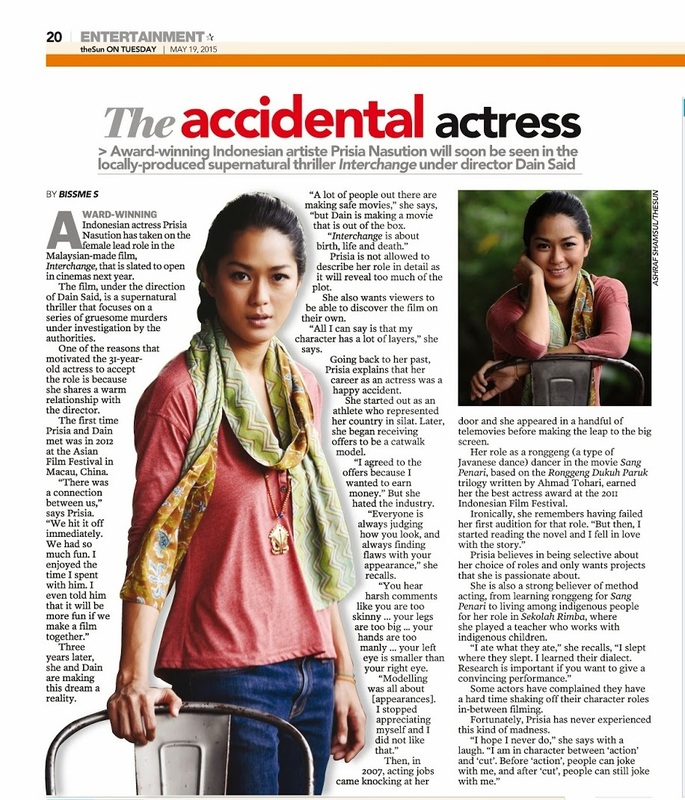 Award-Winning Indonesian actress Prisia Nasution has taken on the female lead role in the Malaysian-made film, Interchange, that is slated to open in cinemas next year. The film, under the direction of Dain Said, is a supernatural thriller that focuses on a series of gruesome murders under investigation by the authorities. One of the reasons that motivated the 31-year-old actress to accept the role is because she shares a warm relationship with the director.The first time Prisia and Dain met was in 2012 at the Asian Film Festival in Macau, China. “There was a connection between us,” says Prisia. Three years later, she and Dain are making this dream a reality. Prisia is not allowed to describe her role in detail as it will reveal too much of the plot. She also wants viewers to be able to discover the film on their own. Going back to her past, Prisia explains that her career as an actress was a happy accident. She started out as an athlete who represented her country in silat. Later, she began receiving offers to be a catwalk model. But she hated the industry. flaws with your appearance,” she recalls. “You hear harsh comments like you are too skinny … your legs are too big ... your hands are too manly … your left eye is smaller than your right eye. Then, in 2007, acting jobs came knocking at her door and she appeared in a handful of telemovies before making the leap to the big screen. Her role as a ronggeng (a type of Javanese dance) dancer in the movie Sang Penari, based on the Ronggeng Dukuh Paruk trilogy written by Ahmad Tohari, earned her the best actress award at the 2011 Indonesian Film Festival. Ironically, she remembers having failed her first audition for that role. Prisia believes in being selective about her choice of roles and only wants projects that she is passionate about. She is also a strong believer of method acting, from learning ronggeng for Sang Penari to living among indigenous people for her role in Sekolah Rimba, where she played a teacher who works with indigenous children. “I ate what they ate,” she recalls. Some actors have complained they have a hard time shaking off their character roles in-between filming. Fortunately, Prisia has never experienced this kind of madness. “I hope I never do,” she says with a laugh. 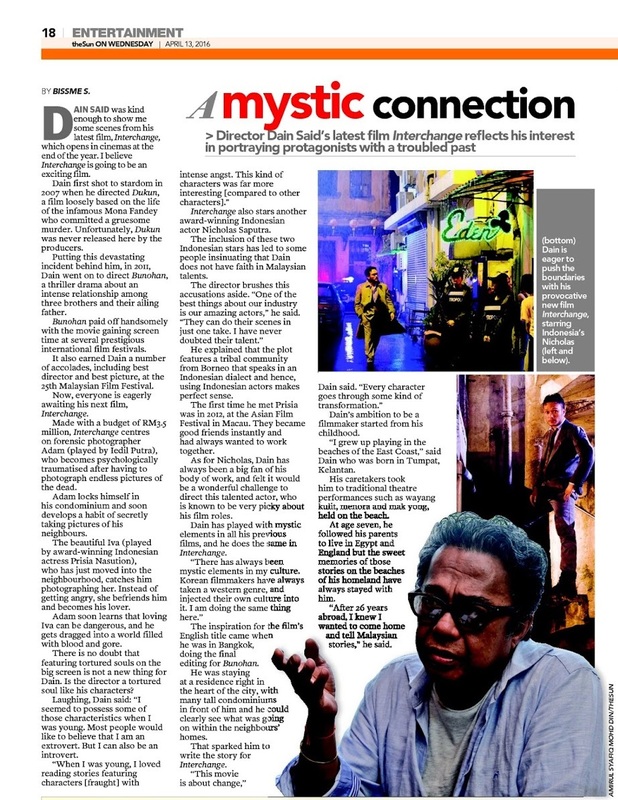 Actor Iedil Putra’s dream of working with award-winning director Dain Said has finally come true. The 32- year-old has a starring role in Dain’s upcoming film, Interchange, a supernatural thriller that will open in cinemas at the end of the year. “I loved Bunohan, and I have always wanted to work with [Dain],” says Iedil. In Interchange, the actor takes on the role of forensic photographer Adam, who becomes psychologically traumatised after photographing numerous brutal crimes. loving Iva can be a dangerous thing when he gets dragged into a dark world filled with blood and gore. “I knew I would be in good hands when I accepted the role,” Iedil says of Dain. He loves the fact that the director organised a lot of meetings and also conducted rigorous rehearsals with his cast before shooting began. “Dain wants his actors to get into the skin of their characters,” Iedil says. Iedil adds that Dain loves to use literature as a reference, pointing out that the director’s office is filled with books. He was even asked by Dain to read Albert Camus’ The Stranger to better understand his Adam character. 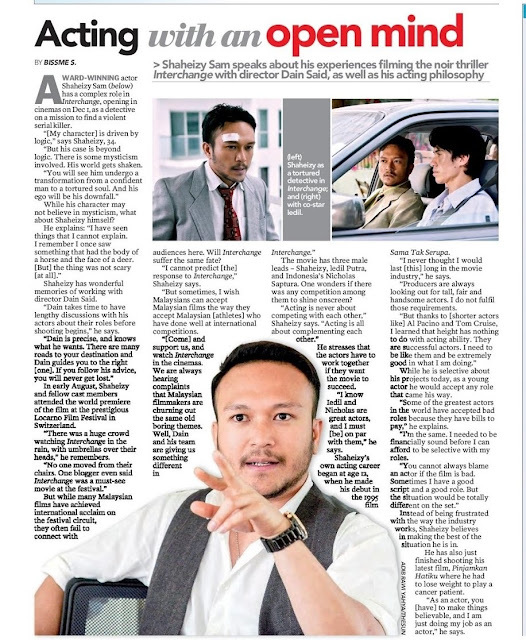 Since his character is from Sabah, Iedil says Dain got a dialogue coach to teach him the Sabahan accent. “A lot of East Malaysian elements can be seen in this film,” he says, adding that this is something we seldom see portray in local films. Iedil is also excited with the news that Interchange has been picked up by Paris-based distribution company Reel Suspects. “I am always jealous to see our neighbouring countries producing good movies that have been widely accepted in international film festivals and international market,” he says. “We should be doing the same. At the end of the day, as an actor, I want to be involved in good projects. We should be paying more attention on developing good scripts.” Iedil has been acting professionally since he was nine years old. His first attempt at acting was in a stage play, I Remember the Rest House by the late director Syed Alwi. He also appeared in a handful of other plays. But at age 17, Iedil received a scholarship to study medicine in the United Kingdom. But Iedil could not see himself as a doctor “when I am 65”, so he quit his studies and became a full-time actor. Iedil has since delivered some notable performances as an actor such as playing a racist schoolboy in the stage play Parah, and an arrogant actor in the film Terbaik Dari Langit. When asked if he has any regrets choosing acting over medicine, he says: “Sometimes the industry can kill your spirit, and there are times I feel jaded being a Malaysian actor. “It is difficult to get good scripts and good roles. Sometimes, you have to accept roles that you are not happy with because you have to put food on the table. “In some productions, I am given a script just a day before the shoot. Sometimes, the script gets written on the set just hours before shooting begins. How do you expect an actor to get into his character just hours before the shoot? Actress Nadiya Nissa’s character in Interchange, Sani, is more than 100 years old, but seems to have the power of eternal youth. “Everyone lives and dies,” said the 31-year-old actress. Nadiya was not the first choice to play Sani. The talented Sofia Jane had been cast in the role first, and had already undergone rehearsals with the production team. But at the last minute, things did not work out, and Nadiya was pulled in to replace the veteran actress. “I have fears that I will do not justice to the character because I had a limited time to prepare,” Nadiya said. But Nadiya listened to her gut feeling, and changed her mind. “I know Dain Said (the director of Interchange) will [do a good] job,” said Nadiya. Dain conducted several intense rehearsals with Nadiya for her to understand her character. This is not the first time the two have worked together. 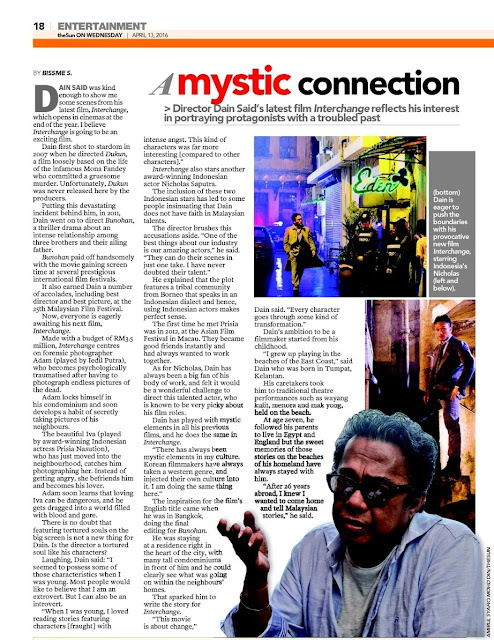 Nadiya had worked on his previous film Dukun (completed in 2007, but never released) and enjoyed the experience. “I was only 18 when I first worked with Dain,” Nadiya said. During post-production, Nadiya was happy to see that her scenes turned out well. She is aware that when Interchange opens in cinemas on Dec 1, people may compare her performance to how the role could have been performed by Sofia. “I adore Sofia very much,” she says. “Sofia is one of the best actresses in our industry. If people said Sofia could have done the role better than me, then it is good for her. I will push myself to do better next time. I will not have any resentment. Interestingly, in 2014, Nadiya played a young upcoming actress who called herself Sofia Jane in the movie Terbaik Dari LangitShe even imitated the famous coffee-drinking scene from Perempuan, Isteri Dan ... ? (1993) that shot the real-life Sofia to stardom. The role got Nadiya the award for best supporting actress at the Malaysian Film Festival last year. Her role in Interchange has her going toe-to-toe with award-winning Indonesian actor Nicholas Saputra. “I am a fan [of his],” she says. Nadiya added that Nicholas was kind enough to help her to get into her character once he learned she joined the project late. “He is not a selfish person but helpful and kind,” she said. Nadiya said she has always loved acting, since she was a young girl. Her mother encouraged her ambition, and Nadiya confessed she would love to act “till my hair turns white”. “This is not an easy dream to achieve,” she explains. “Some production managers will call you and just ask you if you are free on certain dates to act in their projects. Then, they will ask you about your [fees]. But they will not tell you about the script and your role. “The script will be given to you just three days before the shoot. In some cases, you only get the script on the set. These people just want you to come on the set, and [say] the dialogue. They do not care if you fit in the role or not. They do not care if you can give a good performance or not.It just goes to show the industry does not respect actors. This can be very demoralising. “You begin to question why should you put your heart and soul in your role, when such attitudes exist. All I can do for now is to develop a thick skin, ignore such attitudes and only hope the industry will change for the better."